Now that Wilson is not in preschool, Miller and I have another playmate during the week. We all had a great day together on Thursday. To start, I was in Miller’s class during CBS because it was our group’s week to help out in the children’s department. If I have to be in Children’s then I really like to spend that time in my own kid’s class. It is always nice to see how he interacts with his classmates and teachers. After CBS the weather was gorgeous! We headed straight to the playground next door to spend a few hours. During that time, Wilson and I had a good game of “throw the gum ball” going. Now, this isn’t gum that you chew, but the gum balls that come off of a gum ball tree – they look like round pinecones. At first we threw them at each other, but then began to try to make baskets into the trashcan with them. This took up at least thirty minutes. Miller caught the moment on camera. The boys were so tired when we finally got home that I laid in bed with them to take a nap. Wilson fell asleep immediately and I tried to sleep while Miller continued to climb all over me. Eventually Miller did find something to entertain him so that I could sleep for a short while. A ten minute nap is all that I require in order to rejuvenate myself and make it through until the end of the day. It was a wonderful day. The best part was that I got to spend the afternoon having fun with Wilson and Miller. We spent lots of quality time together doing things that were fun and exciting. I have really enjoyed having Wilson with me and look forward to more days like this. one. 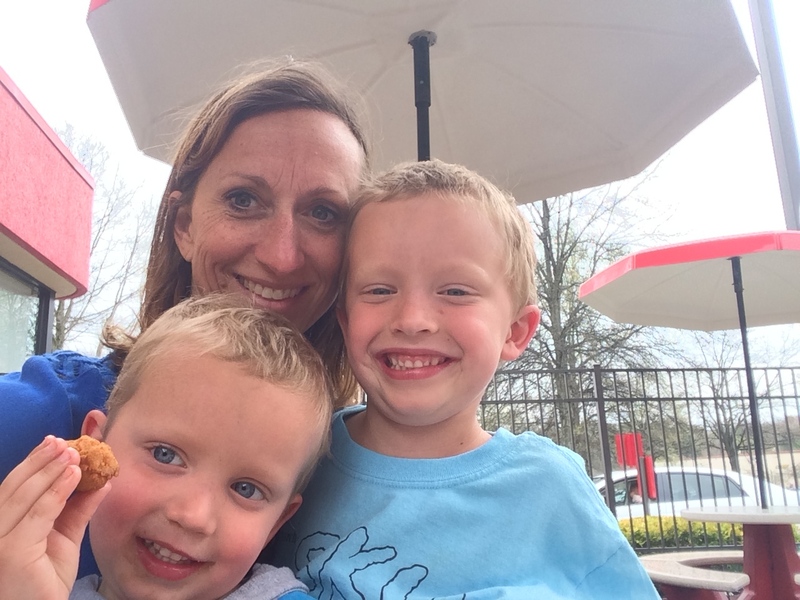 This entry was posted in Uncategorized and tagged chickfila, Miller, Play, wilson on March 30, 2015 by Becca. Wilson had his final spring show at his preschool last week. Not only was it his last show, but it was also his last week of school. Wilson has been asking me for months to take him out of school and let him stay home with me. I didn’t take him too seriously because I knew how much he loved school and enjoyed seeing his friends. When I dropped him off at school he would run into the classroom and rarely look back at me to say ‘goodbye’. I knew how much he loved school and thought that he couldn’t, and wouldn’t, have more fun at home with me. However, after months of asking, I finally gave him his wish – I told the director that as of April 1, Wilson would no longer be attending preschool. I think that they took it a bit personally at first, but I tried to reassure them that no matter how much Wilson loved school, he loved being with his Mommy more. This is the last time in the next 13 years of his life that he can say that he doesn’t want to go to school, and he truly doesn’t have to go. As I said in my last post, Wilson has grown up and changed so much in the last six months. He has learned everything that preschool can teach him and he just wants to be home and have fun…..and I want him to be with me too. As it worked out, thankfully, I am able to bring him with me to Bible study on Thursdays (because they had the space for him) and my boss is letting me bring him with me on Fridays to join the older 4s class (most of the students he already knows from last year on Fridays). It worked out perfectly which made me feel much better about the decision. At the spring show they sang many Disney songs – Hi Ho, Hi Ho, Peter Pan, Lion King, and the grand finale was “Let it Go.” The children sang quietly on most of the songs, but during “Let it Go” they burst forth in song – meaning they almost yelled the words. It was awesome. If I knew how to upload it I would. I will put it on my Facebook page for those of you that are interested. Here is Wilson singing with his Peter Pan hat on…. After the show there is a raffle along with snacks and juice. The kids were upset that we didn’t win any prizes last year. I prepped them so that they would be prepared to lose again this year, but thankfully we won the 50/50 prize – $42. I gave Wilson $6. You would have thought that he had won the lottery! The usual suspects were in attendance – our family, my parents and Grandmama…. Here is a picture of Wilson and his teacher, Miss Kerry. Our family loves Miss Kerry! She was Faith’s teacher and then she was Wilson’s teacher. So sweet and laid back. Just like every preschool teacher should be. Cross and Crown has been a great preschool for our family and I would highly recommend them to everyone. We can always go back to visit. This entry was posted in Uncategorized and tagged cross and crown, show, spring on March 26, 2015 by Becca. Wilson has grown up right before my eyes over the last month or two. This transformation is so evident that I believe he deserves his own blog post. He hasn’t been a baby in a very long time but this little man is so new to me. He has really matured with his school work. He used to insist on holding his pencil like a caveman, but all of a sudden he has decided to hold it the right way, and actually write for pleasure. He has begun drawing pictures and writing notes to us. He even drew a chart of his dresser drawer contents and hung it up for reference. He is constantly asking for paper and markers. This is a picture that he drew a few weeks ago that surprised me (not because it is a person with a sword through his head) but because it is really good and creative. I had no idea that he could draw. His reading is improving as well. Wilson has begun to read short books and asks for me to make him flashcards with sight words on them. Who is this kid?!?! I am so proud of him. He doesn’t react or hit back when Miller does something mean to him and he often offers to help Miller. Wilson loves to make his own food (even if it is a mayo and mustard sandwich) and I am definitely encouraging that behavior…one less thing for me to do. Basically, Wilson is becoming a huge help to me. He wants to please us and is getting the positive attention that he is wanting and deserves. The changes within him are so visible and tangible, and I couldn’t be more proud. This entry was posted in Uncategorized and tagged growing, up, wilson on March 24, 2015 by Becca. Yesterday Tom and I did something completely different – we went on a date during the day…to a bar. Our friend, Josh, was having his birthday lunch at VGBG in the NC Music Factory complex. VGBG is a bar that serves many beers on tap, has games to play and a half dozen sand volleyball courts that were packed full of serious volleyball players. The day couldn’t have been more beautiful. It was so relaxing to sit outside, eat lunch, drink a beer and enjoy the weather. I felt like I was back in college again (except that I only had one beer and had kids to go home to). I made Tom take a picture with me so that I could prove that we were actually out on a date together. We enjoyed lunch for a few hours, went home to take a nap, and then had a realtor come over to tell us what we could get for our house (which will be a different blog post at a later date). I enjoyed spending the day with Tom and our friends. I would love to do it again sometime very soon. This entry was posted in Uncategorized and tagged Becca, date, tom, vgbg on March 22, 2015 by Becca. Over the last two weekends the kids have not been inside at all. They have been running around the neighborhood and through the woods. Tom has been pressure washing the house and working on our curb appeal (which has suffered greatly since we had the three children). The kids even put their rain gear on and went out to play in the power washer spray. And what have I been doing during all of this lovely spring weather? Painting!! I have sanded and painted the ceiling in two rooms upstairs, painted the new bathroom, painted the huge downstairs hallway, and painted the dining room. All of this in preparation for putting the house on the market. I have painted so much that I have given myself carpal tunnel. My hand literally begins to go numb when I hold a paintbrush for more than five minutes. I told Tom this morning that my painting days are over. Either he can do the rest or we can pay someone to do it since there really isn’t much left to paint. I am now going to focus on packing up toys and cleaning up the aftermath from scraping the ceilings. I am also going to relax on the back porch and enjoy the weather. I may get a bit bored with Charlotte sometimes, but you really can’t beat the weather. Spring is a beautiful season in NC. God did a great job planning it so that spring would last over two months – a different plant blooms every other week between now and the middle of June. Right now the pear trees are covered in white blossoms and the forsythias are a brilliant yellow. The azaleas will be in bloom before you know it and then the crape myrtle trees will finish it all off in the summer. Growing up in Florida, I had no idea what spring was or that flowers bloomed during it. I was young, oblivious, and it was always summer. Then I moved to Colorado where it was winter for seven months out of the year. Spring was considered “mud season” and so no one stuck around during May to see it – they all went on vacation. It probably took me seven years to fully appreciate all that spring has to offer here in NC. I don’t think that I really paid much attention to it for the first give years. It just wasn’t my thing. Now, I love it. I am excited to see what will be blooming next week. This entry was posted in Uncategorized and tagged flowers, house, spring on March 18, 2015 by Becca. The new Cinderella movie came out this weekend and we were invited to go watch it with Sidney and Jesse. I had not been to a theater in many, many years. I honestly could not tell you the last movie that I saw outside of my living room. I had definitely never been to a theater with seats as comfortable as the ones at Crown Point, which was just recently renovated. It has electric, leather-like recliners and swivel tables. It was awesome!! I could relax, prop my feet up and enjoy a movie – just like at home, but better. Here are the seats….. Overall, the movie was wonderful. The underlying theme was more about love, kindness, and good parenting – more so than just about a girl and a prince. Good things happened to her because she was kind to others, and not just because she was beautiful. Faith and I really enjoyed ourselves this afternoon. I need to remember to take the time to do more new and exciting things with her….she is my little girl. This entry was posted in Uncategorized and tagged cinderella, Faith, jesse, movie, sidney on March 14, 2015 by Becca. This is what our driveway looked like at 6:00pm Friday night. It was getting cold and dark, but we were still busy setting up for our garage sale. We spent most of the afternoon yesterday cleaning out our shed and bringing things upstairs from the black hole that we lovingly call “the supply closet”. I knew that we had a lot of stuff but I truly had no idea how much space all of this stuff would take up. Our driveway was full of toys, vases, clothing, furniture, cables/cords, etc. I was a bit ashamed that we had so many things that we didn’t use nor want. As our neighbor told his wife, “They have a lot of crap out there.” Of course that same neighbor came and bought our fake trees and a ladder. :). Some people don’t like garage sales because they have issues with strangers going through their belongings. Not me! I looked at most of that stuff and had zero personal attachment to it. Most of it had been given to us and some of it was stuff that Tom brought into the marriage that had never even been used. Tom’s big saying for the weekend was “get rid of it!”. Our motivation for having the yard sale is that we didn’t want to have to move it all to the next house after we sold this one. We are preparing to put the house on the market and move in the next few months. The last thing we need is cart all of the stuff that we haven’t used in years to another house so that it can all just sit there and take up space again. Honestly, it felt great to get rid of all of that “crap”. It truly was all just stuff that we didn’t need. We should have been embarrassed to have all of those things that we deemed virtually worthless. There are people around the world with nothing and we had an entire driveway of stuff that we didn’t want and that we were selling for almost nothing. There were a few items that I wanted to make some money on and I tried not to think about how much we spent on it compared to how much we made at the sale. Even after the garage sale was over, we were still able to fill up Tom’s Volvo with all of the stuff that we didn’t sell. Tom said that the guy at the Goodwill rolled his eyes and said an expletive when he saw Tom rolling up with an SUV full of stuff to donate. Today Tom commented about how much lighter he felt knowing that all of that extra stuff was gone from the house. It really was a stress reliever to empty out the shed and the supply closet. Overall, the yard sale was a success. It required a minimal amount of work, and we made a good bit of money taboot! This entry was posted in Uncategorized and tagged garage sale on March 7, 2015 by Becca.